Minecraft has always been, first and foremost, about creativity and exploration. Combat is elegantly woven in. Many players do regret that there is a lack of weapons, however. The Battlegear Mod for Minecraft sets out to implement a number of new weapons to make combat a more diverse and exciting experience. Typically, Minecraft offers only a few weapons: swords, axes and bows. These can be “crafted” from various materials ranging from wood up to diamond, increasing in strength as they proceed through the material range. Armor can also be crafted and equipped as needed. 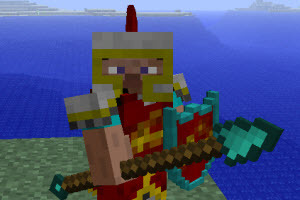 Battlegear Mod for Minecraft expands upon this arsenal by allowing players to use the pre-existing Minecraft materials to build battle axes, spears, and maces. Another nice addition is the ability to craft a shield. This comes in especially handy when a Creeper threatens the player. If this creature gets too close, it violently explodes and takes out all the blocks in a specified radius. By using a shield, the player can push back Creepers so that they are out of range of valuable structures, the player and his comrades. Armor has also been improved with the addition of chain mail. This armor type has a strength midway between leather and gold armor. It is a good choice for players who are short on valuable metals but would like more of a defensive edge in combat. In addition, it fits in well with the visual style provided by the mod’s medieval weaponry. For players who would like to bring the medieval combat elements of MMORPG games into the Minecraft world, the Battlegear Mod for Minecraft is sure to provide many hours of exciting new gameplay.